You can earn all 40 hours required for renewal through APA-approved online CE courses @ PDR. Order now and save 20% on ALL courses! Over 100 online courses to choose from! for your Florida Psychology license renewal. Use coupon code PDR368 at checkout to redeem. Valid on future orders only. Offers expire 5/31/2018. Click Here to Save 20% on CE! Courses are valid for 3 years from purchase date (including Closeout courses), so you can also stock up on CE to save for your next renewal. Your certificate of completion will be dated the day you submit the course evaluation. Coupon valid on future orders only and must be applied at checkout to redeem. Discount should automatically apply at checkout (assuming profession/state combination have been added to account). Otherwise, enter promo code PDR361 before payment information to add. Coupon expires 5/31/2018. 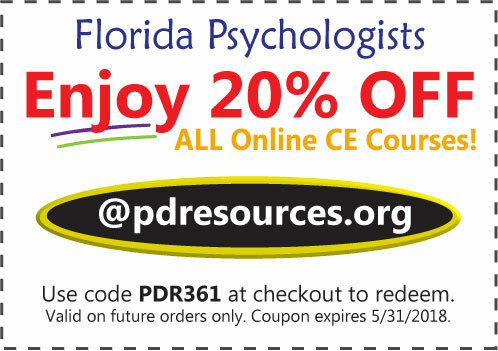 Over 100 online courses for Florida psychologists available @pdresources.org. We report to CE Broker for you.